These DECEUNINCK QUICK STEP FLOORS bib tights are very comfortable with its anatomical fit and Roubaix fabric for cold climates. Complete your DECEUNINCK QUICK STEP FLOORS outfit with this summer cap. Summer gloves of the 2019 DECEUNINCK QUICK STEP FLOORS professional cycling team. The DECEUNINCK QUICK STEP FLOORS Technical Winter jacket is a high-quality warm winter jacket with a comfortable fit. 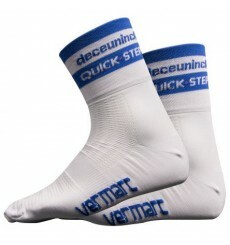 The DECEUNINCK QUICK STEP FLOORS long sleeved cycling jersey is ideal for the colder days during the summer. Official kid's cycling jersey of the 2019 DECEUNINCK QUICK STEP FLOORS professional cycling team.